For my last two meals made with the remaining kona kampachi, I chose two of my favorite recipes. Both dishes are pleasing to the eye, and quick to make. 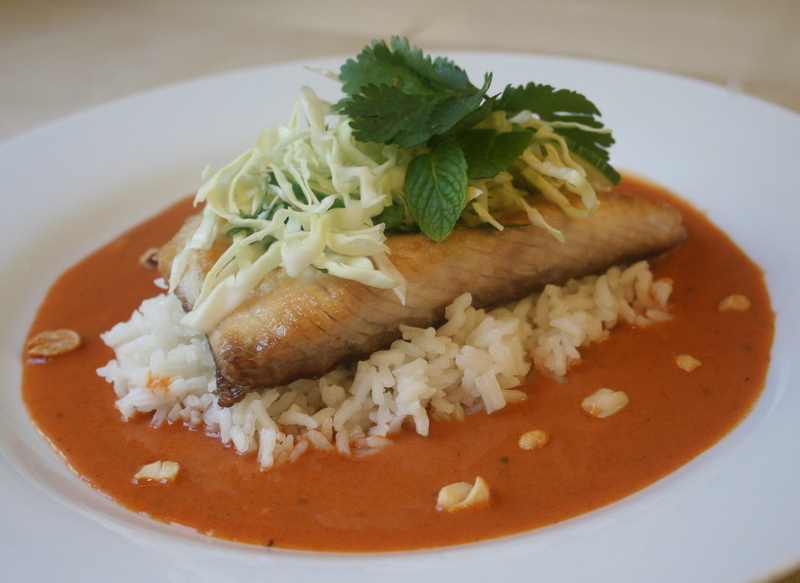 The first uses a sauce made from Thai curry paste, with a tangy slaw of cabbage, cucumbers, mint, and cilantro resting on top of the fish. The contrasting textures and flavors make this a memorable dish. I've made it before with salmon, and it worked very well here using the kona kampachi. Several weeks ago Northern California went thorough a severe rain and wind storm. I woke up to find sections of my fence flattened, my yard flooded, and angry squirrels who blamed me for all of it. It was pretty dismal, until I read an e-mail sent to me from the good people at Kona Blue. They offered to send me their product, Kona Kambachi, at no cost, so I could test it out. I immediately Googled the company, discovering that Kona Kambachi is a premium sushi grade yellowtail species, full of omega-3 oils, mercury free, and farmed in Hawaii without damaging the ocean environment. 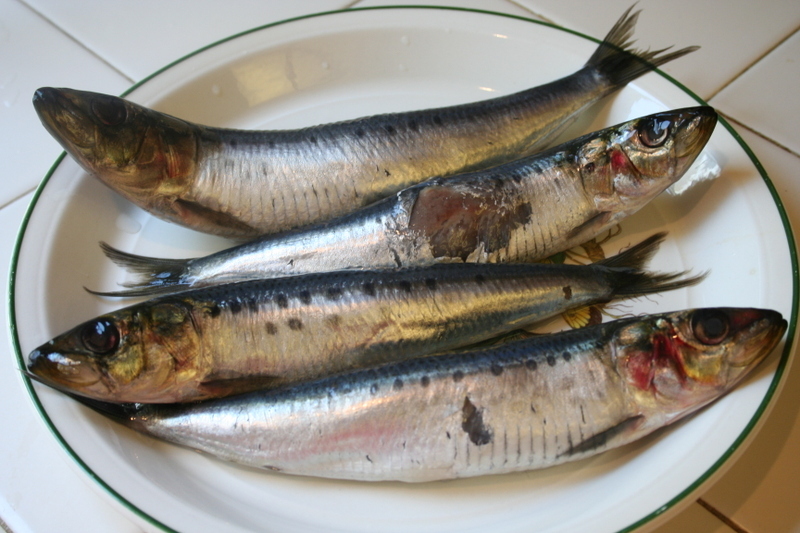 And the fish is much sought after by top chefs, due to it's taste and texture. Suddenly, the flooded yard and angry squirrels faded in importance. I've always wondered about the quality of sushi grade fish sold by mail, and now I was about to receive some, no strings attached. The more I read about the fish from a variety of sources, not affiliated with Kona Blue, the more I looked forward to receiving it. In my research, I found that most chefs like to serve the fish raw. So, I decided that the first dish I would make would be an adaption of a recipe from the cookbook Terra, which calls for sushi grade salmon and tuna, dressed with a lemon-ginger vinaigrette. Using the Kona Kambachi, it wound up being a memorable dish. Maybe you heard about the big storm that hit us here in California over the Weekend? It was quite something, with heavy rain and winds up to 70 MPH. Sections of our fence collapsed, and I finally got the pool I've always wanted, when part of the backyard flooded. The squirrel cage just missed being flattened during the storm, but was heroically pulled to safety by me, in a driving rain. And a fat lot of good it did for me, as the squirrels decided the weather was my fault and chewed me out in Squirrel Speak for hours. In case you didn't know, Squirrel Speak sounds like a machine gun going off. Most of my meals came out of cans. But, that was fine, as evidenced by these marvelous fishcakes made from canned sock-eye salmon. The delicious Nigella Lawson recipe is a snap to make and the fishcakes freeze beautifully, providing great meals in the future. 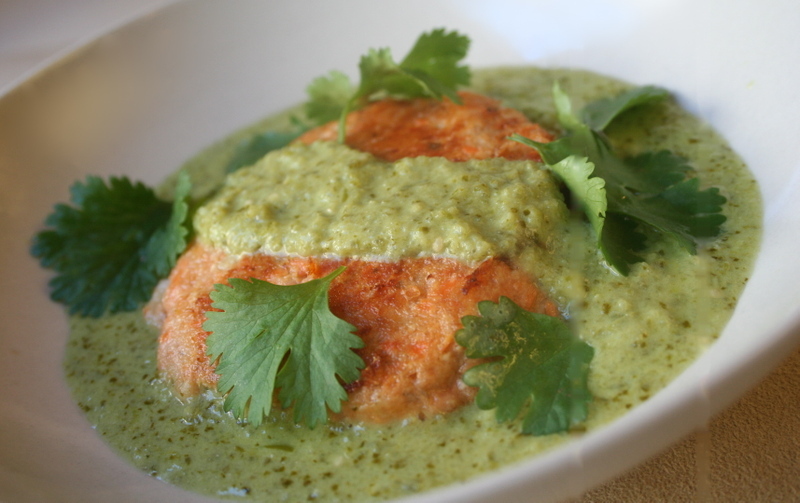 I lavished tomatilla-cilantro salsa on the fishcakes, as you can see in the photo. Frankly, I was tempted to quaff the entire tangy bowl, as if it was a smoothie. The salsa isn't hot, as it's made with poblano peppers, and would work on other types of fish or chicken. This is the most dangerous time of the year for me, in terms of food. I feel like I'm walking a minefield, with tempting foods lurking everywhere. Suddenly cookies, cakes, fancy breads, and candy appear, ready to blow away all my resolve to eat sensibly. I know there will be sanctioned events like Thanksgiving and Christmas, where I allow myself to run riot at the dinner table. But, for right now, I want to play it cool. 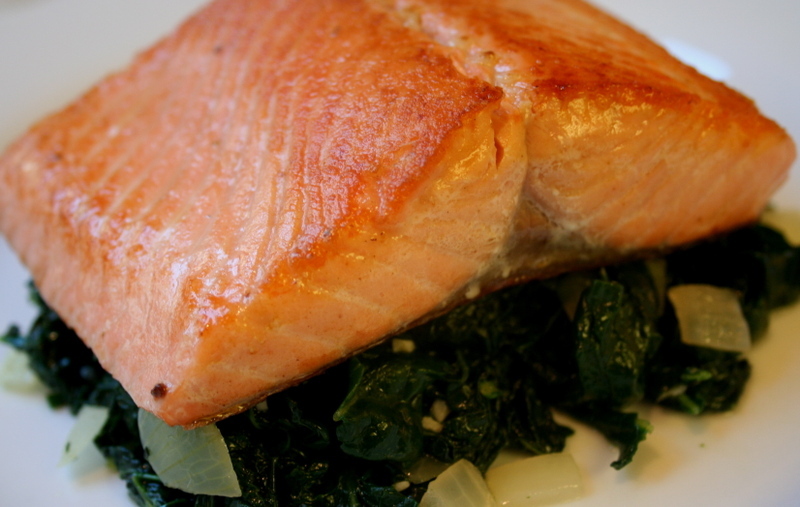 Yesterday I saw some beautiful steelhead trout and kale at Whole Foods, so I snapped it up for dinner. It was a simple meal, but very satisfying. Then I white knuckled the rest of the evening, refusing to eat anything else after dinner. My body was arguing with me, reminding me that I could defrost some bread and make myself a nice tomato sandwich as I watched Dexter. Well, I managed to avoid doing that. But, it was hard. Well, this was a good day, because I prepared and ate this marvelous dish. It definitely makes it on the list of my favorite meals for this year. It comes from the genius Cindy Pawlcyn, who knows how to combine flavors so well. Everything about this dish delighted me--the flavors and textures, and the simplicity in preparing it. I'll be making this again and again. Since it contains lemongrass, I'm making that my herb of choice for Weekend Herb Blogging. Lemongrass used to be one of those ingredients that I would read about, but it was never in any of the grocery stores where I lived. But, now it's always in the stores around here. And that's a very good thing, because lemongrass has a lovely floral taste that's quite distinctive. I hope it becomes as common as bananas in groceries everywhere. This week WHB is being hosted by Katerina at Daily Unadventures In Cooking. Stop by her site and see all the great herby recipes in the Roundup. And make sure you check out Kalyn's Kitchen, our fearless leader's blog. Almost two years ago Kalyn created WHB and the anniversary celebration should be quite spectacular. Who knows what Kalyn has in store? There are times when I simply can't bear to cook anything complicated. I don't think I'm alone on this. So, it's good to discover a very fast, and delicious recipe. And there it was, in The Zuni Cafe Cookbook, often thought way too complicated for ordinary people. I've found amazingly easy recipes, and great reading in it, and this is one of them. Actually, this is a simplified recipe, suggested by the author of the cookbook, Judy Rodgers. 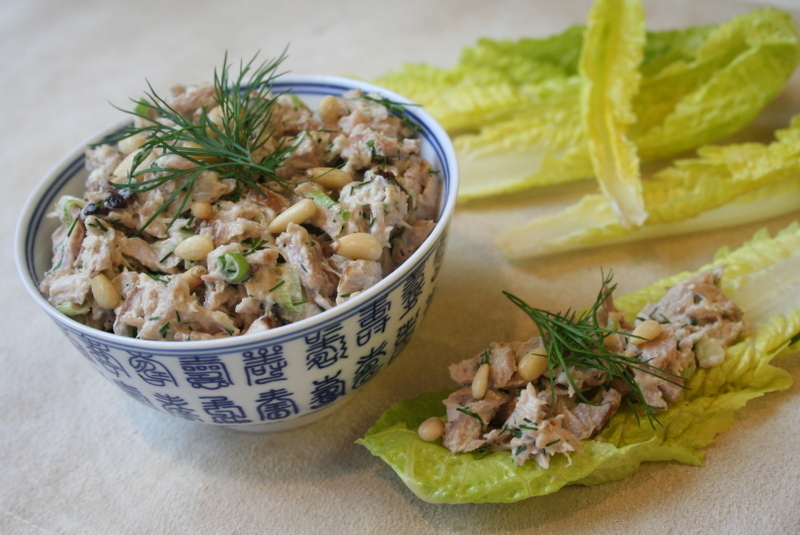 I would love to fix a confit of preserved bluefin tuna and toss it with pasta as she did. And some day I will. 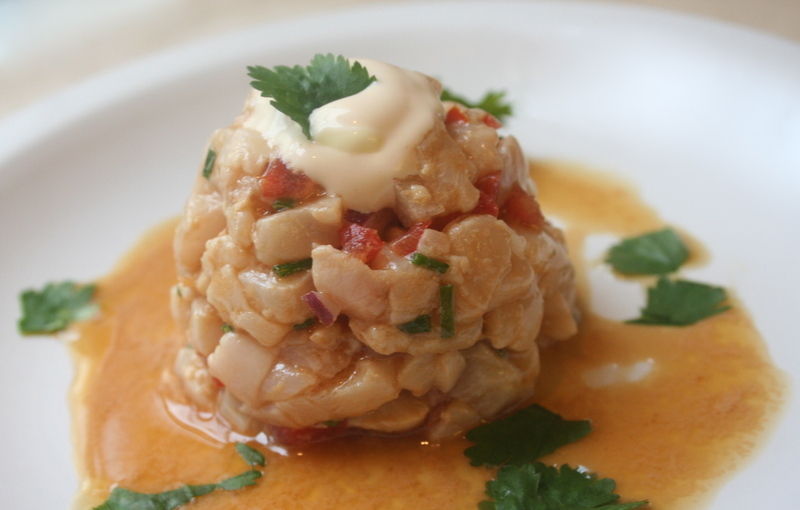 But, I took the author's recommendation for an easier version and used excellent Italian canned tuna packed in oil. 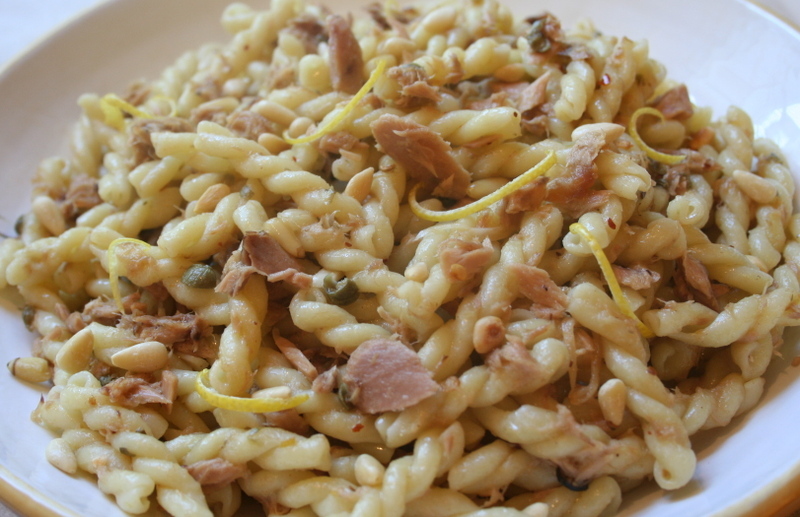 It was combined with a "sludge" of pine nuts, bay leaf, lemon zest, capers, garlic, fennel and cumin seed steeped in olive oil, then tossed with my favorite pasta--gemelli. It was a marvelous dish. Each mouthful had a slightly different taste. One minute it was the fennel, then it was garlic and capers. And it was so simple, not taxing at all. So, if you are of faint spirits lately, here is a nice dish for you. It's also perfect for Presto Pasta Night, which was created by the lovely Ruth at Once Upon A Feast. 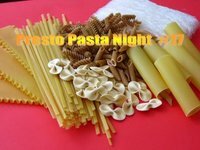 Check out all the pasta dishes at her site. Several years ago, I bought a wonderful cookbook called Terra, Cooking From The Heart Of The Napa Valley, by Hiro Stone and Lissa Doumani. As often happens, I've enjoyed reading this book and imagined cooking several of the recipes, but never did so. 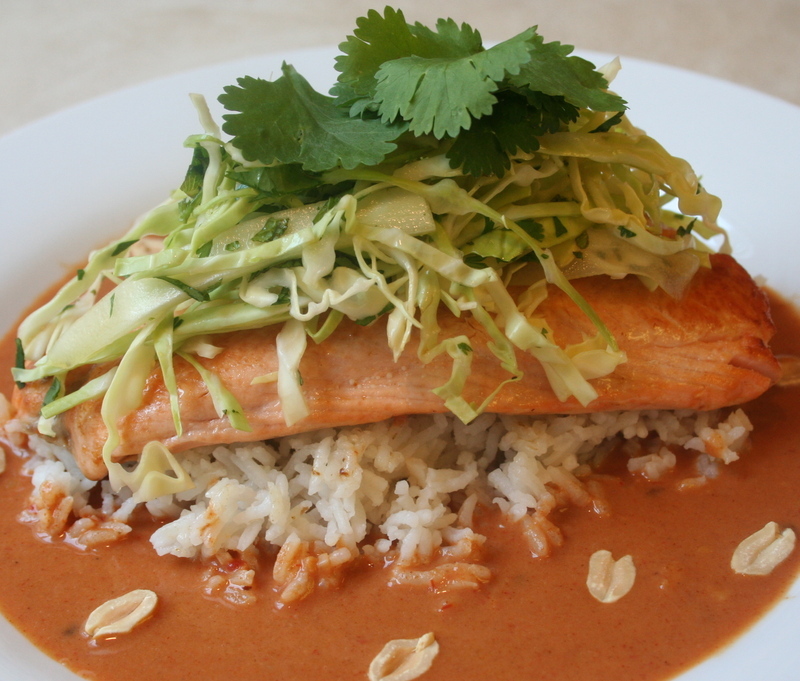 One dish in particular has appealed to me, a fillet of grilled salmon on top of rice, surrounded with a lovely red curry sauce, and topped with crunchy cabbage salad. It's exactly the kind of dish that appeals to me. So, I decided the time had come to make this dish, and I was not disappointed. The sauce is slightly nippy, but not overpowering, and absolutely delicious. The cool, crisp salad is perfect with the soft and succulent salmon. The dish looks impressive, but is actually quite easy to make. It would be perfect for a dinner party, because you can prepare the rice, sauce, and salad in advance, leaving the salmon, which takes less than ten minutes to cook. This recipe is full of herbs and spices, which makes it a noble candidate for Weekend Herb Blogging, created by Kalyn at Kalyn's Kitchen. This week WHB is being hosted by Rinku at Cooking In Westchester-the practical, spicy, flavorful Way. 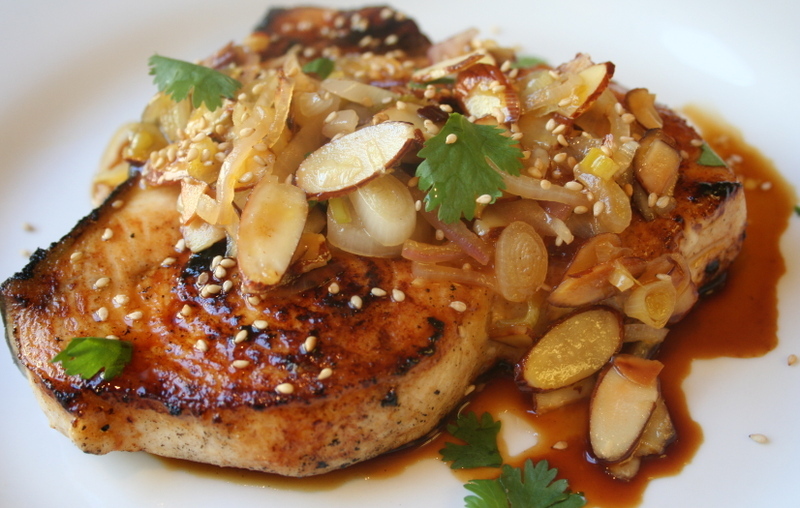 Check out the Roundup of herby recipes at Rinku's site, you'll be glad you did. It was quite easy for me to choose my herb this week. Look at the lovely cilantro gracing the top of the dish. My favorite herb is cilantro, hands down. Some people hate it, which is unfortunate. But it appears that this dislike is genetic, so why torture yourself? If that's the case, you could just use the mint. This was one of my favorite meals this year, so I recommend this to those who like this type of cuisine. I also recommend the cookbook, Terra. 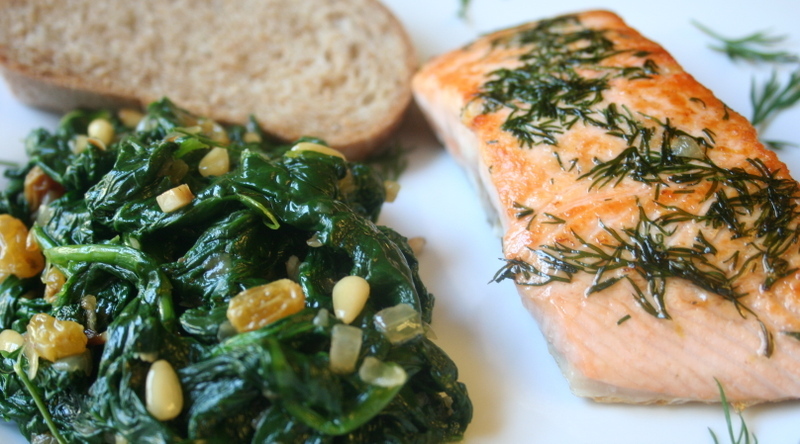 My friend Nancy has been asking me when I would post the meal of salmon with spinach I prepared over a week ago. Like me, she loves that combination. 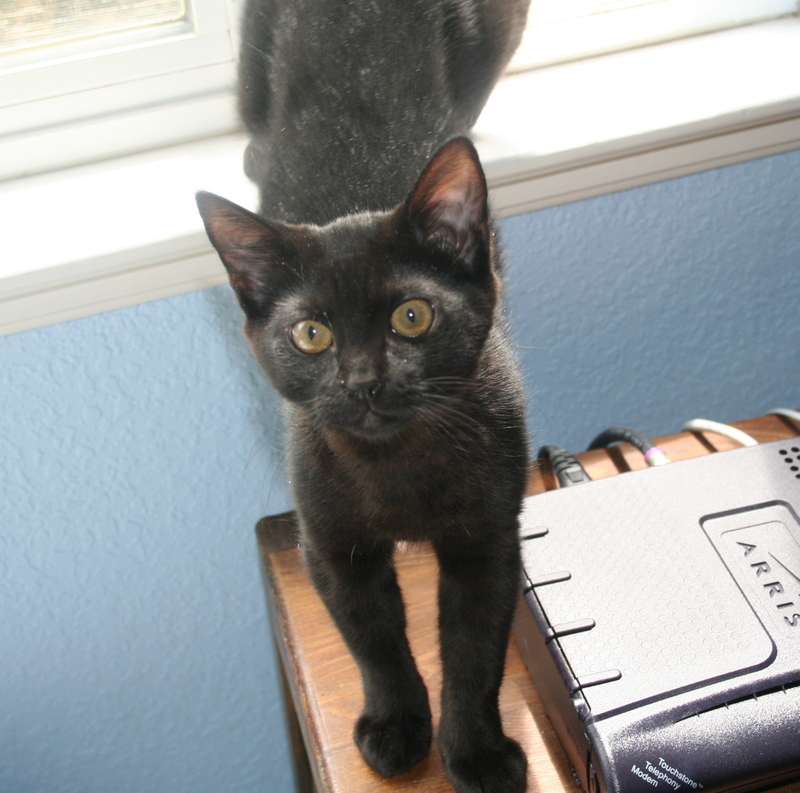 So as requested, here's the post Nancy. I have to take my hat off to her, because she uses my blog for menu ideas, and prepares most of the things she sees here. It's a huge relief when she and her family like the recipes. You never know if someone will hate something you recommend. I do like the combination of salmon and cooked greens. The slightly bitter taste of cooked greens paired with the sweet salmon is always terrific. Frankly, if you have a good piece of salmon, you don't have to do very much with it. Here, I dusted the fillets with some grated lemon rind and chopped dill, and pan grilled it. Very simple and quite good. The spinach has raisins, onions, and pine nuts in it. This was a fast, healthy and delicious meal. Hope you agree Nancy.